Create a blank C++ project and then, navigate to Edit -> Plugins menu and click the New Plugin button on the bottom right corner. 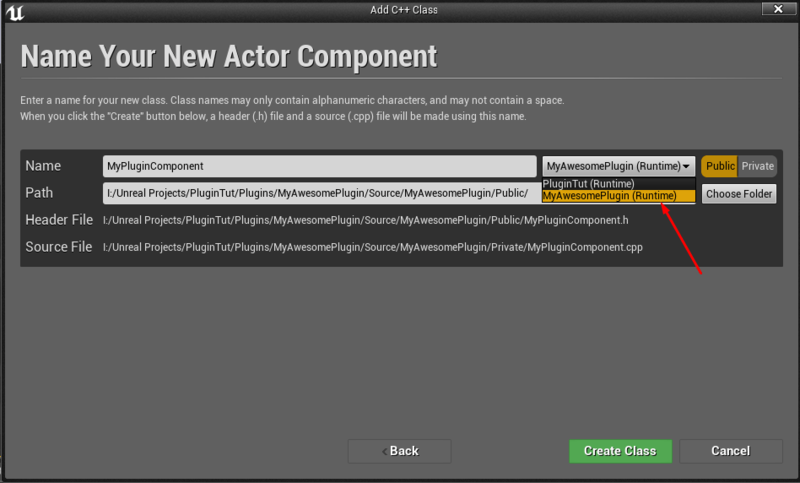 Then, select a blank plugin and name it MyAwesomePlugin just to match the post’s instructions. When Unreal has finished creating your plugin, you have to restart your editor and rebuild your project so your plugin can be included in your project. Once you have completed these steps, open your project inside visual studio and locate the MyAwesomePlugin.uplugin file inside the Plugins folder that has been created by the editor. This file contains all the necessary information about your plugin, while some of these options can be edited through the Editor, I prefer to edit this file instead. Go ahead and perform the marked changes in your file as shown in the screenshot above. We need to mark the plugin as Installed because we would like to export it for later use in another project. Once you perform these modifications, build your project and restart the editor. // Copyright 1998-2016 Epic Games, Inc. All Rights Reserved. #include "MyAwesomePlugin.h" #include "Engine.h" // You should place include statements to your module's private header files here. You only need to // add includes for headers that are used in most of your module's source files though. #include "MyAwesomePluginPrivatePCH.h" #include "MyAwesomePlugin.h" #include "MyPluginComponent.h"
In order to package your plugin, go to Edit -> Plugins menu and select your plugin. Then, select the Package option. The editor will build your plugin for all the supported platforms and create a folder with your packaged build. To use your plugin in another project, copy the Plugins folder (it is located inside [YourExportFolder]->HostProject) inside your desired project. Please note that the target project has to be a C++ project. Working in 4.18 the compilation also fails but the *PrivatePCH.h is not created it seems. I got it working by restarting the editor and building again. I had the same thing happen as well. In 4.19.2 there is no PrivatePCH.h file that is created.